Title Sharks and other predators / by Mary Pope Osborne and Natalie Pope Boyce ; illustrated by Carlo Molinari. Publication Info. New York : Random House, 2015. 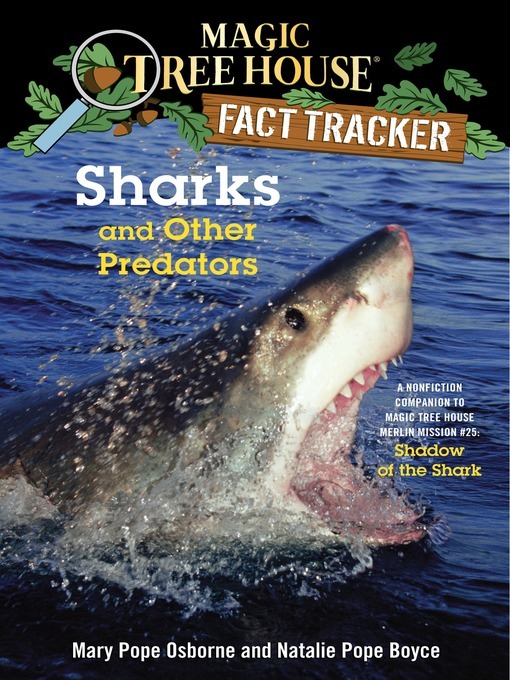 Note "A nonfiction companion to Magic Tree House #53: Shadow of the Shark." Summary Track the facts with Jack and Annie! When Jack and Annie came back from their adventure in Magic Tree House #53: Shadow of the Shark, Filled with up-to-date information, photographs, illustrations, and fun tidbits from Jack and Annie, the nonfiction Magic Tree House Fact Trackers are the perfect way for kids to find out more about the topics they discover in their favorite Magic Tree House adventures. And teachers can use Fact Trackers alongside their Magic Tree House fiction companions to meet Common Core text-pairing needs. Have more fun with Jack and Annie on the Magic Tree House website at MagicTreeHouse.com! Contents Sharks and other predators -- Sharks -- Sharks as predators -- Cats, large and small -- The dog family -- Apex predators -- A good balance. Subject Predatory animals -- Juvenile literature. JUVENILE NONFICTION / History / United States / 19th Century. Added Author Boyce, Natalie Pope, author.